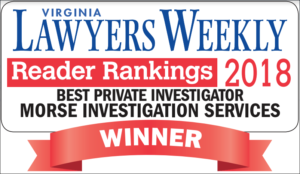 Morse Investigation Services is the top rated professional private investigation agency in Virginia. If you are interested in engaging the services of a professional private investigation firm then look no further. We offer quality services and should be your only choice for all of your investigation needs. Each of our Department of Criminal Justice Services registered private investigators, with over 70 years combined experience, have investigated a variety of different cases for both corporate and individual clients. Because of our experience we know the laws and we know how to conduct a successful and discreet investigation that will get you the results that you require in a timely manner. With our reputation, experience, and expertise you can enjoy a peace of mind knowing that your investigation is in good hands and that you are getting industry-leading professional assistance with your individually tailored case needs. We offer extremely compassionate advice and communication each step of the way throughout your case. We will keep you constantly updated with our state of the art and client friendly secure case management system ensuring timely and transparent updates. You can also be assured that for even the most difficult of cases we will use every investigation method and creative techniques in order to deliver you the best possible results. If warrants or subpoenas have failed, or you require specific hard evidence, we will utilize a variety of legal methods to bring you the results that you need to move forward with your case. Our initial consultations are always completely free. During your initial consult we will look over and evaluate your individual case with absolutely no risk to you. 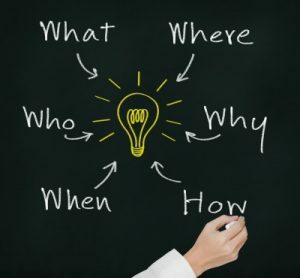 Each investigation is and should be approached in a unique and creative way. All of our investigations are kept confidential and none of your information will be shared at any time without your permission. Morse Investigation Services is here to help and can provide you with industry-leading experts in the field of private investigation. Whatever your needs are do not hesitate to contact us if you require an expert private investigator anywhere in Virginia. Did you know that Morse Investigation Services has been featured on nearly every major news channel in the United States? No child should be subject to abuse, neglect, or abandonment. Making the decision to divorce can have a life changing effect on all involved. Surveillance is a valuable tool in the right hands. 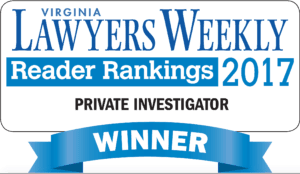 We are an active member of the Private Investigators Association of Virginia. Morse Investigation Services Founder and Owner, John Morse is a former Vice-President of the Private Investigators Association of Virginia and is a current Board Member and Executive Director. 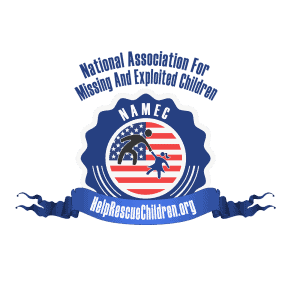 We are proud members of the National Association for Missing and Exploited Children. John at Morse Investigation was phenomenal, he went above and beyond my expectations. I would highly recommend Morse Investigations. I waited 20 years to work up the courage to find someone and Mr. Morse found them in 10 minutes! They are truly open 24 hours, so polite, and very helpful! I would definitely refer them to anyone. Thanks Mr. Morse. The staff has supplied me with proven documents that my husband was definitely cheating. They were there to support and help me during the most difficult time in my life. They were thorough and vety professional. Look no further than Morse Investigation Services for your private investigation needs. John and his team are professional, compassionate, and thorough. The entire team worked tirelessly on our missing person case, taking time away from their personal loved ones during a major holiday to bring back one of our family members. John handled the case with dignity and is a calming presence in the middle of crisis. I would highly recommend Morse Investigation Services. John and his team have gone above and beyond, with outstanding, and very quick service. I highly recommend Morse Investigation Services. Talked with John - a great guy. He helped me out tremendously and also gave me great advice on how to move forward with my situation. I would highly recommend.